Ananth Hirsh & Yuko Ota ... live in Brooklyn, New York. Among their works are Lucky Penny and Our cats are more famous than us, published in Spain by Ediciones Babylon. They have worked with the American publishers Oni Press, BOOM !, Dark Horse, Lerner Publishing and Red5. In addition to their editorial work, Ananth and Yuko have self-published Cuttings, a collection of fiction comics and related illustrations. 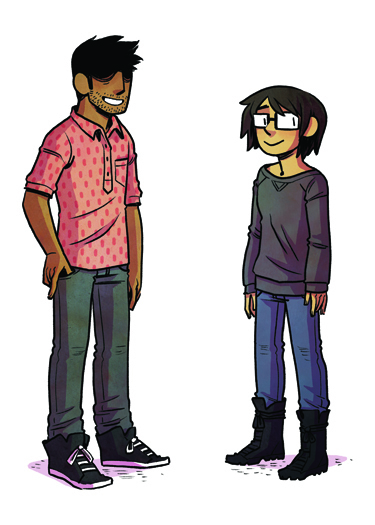 Ananth has another comic, drawn by Tessa Stone, which is called Buzz! You can see more work of Ananth with Tessa in his last collaboration, Is this what you wanted. Yuko and Ananth publish comics online at johnnywander.com, but only in English. His most recent project is titled Barbarous.